I heard this song on a repeat of Cold Case(I'm a diehard when it comes to shows and movies about solving crimes). It reminded me of my first car, a 1978 Toyota Corona. Yes, a Corona. 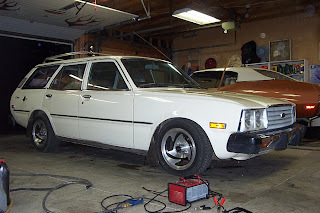 It was little white station wagon I earned for babysitting my cousin for, first 300 hours, then my generous aunt and uncle would give me "hours" for my birthday or Christmas. I think I ended up getting for less than 200 hours. Not bad! I remember my first "road trip", from San Luis Obispo to Fresno to visit my best friend Shelly. You would have thought I was packing for a cruise. This was before Mapquest, so I went off of handwritten directions so as not to get lost. Driving up 41 with the windows all the way down because I had no air, and I had just bought this CD, um, wait, those weren't even around then, CASSETTE, that's what that is, the obsolete cassettes. There was no quick, repeat button to hear the song over and over again, I had to rewind it and guess where it should stop. If you've never rewound a cassette, you would have clue what I was talking about. Or, this tape was particularly cool, I remember this. I could listen to "Back in the High Life", and then flip it over and listen to another one of my favorite songs, and flip it over again, and they both ended and started in the same spots on the cassette! So, I was never without my tunes in the car. When I got to Fresno, my car sat parked in front of her Nana's house and we began to cruise in her Cherry red CRX, her personalized plates still said, REDnSLO, her last name was red, she drove a red car, red was her favorite color. I didn't bother with putting vanity plates on mine, it looked like a little white pill. But, it was mine, and I was free. Just out of high school and I could go anywhere, or so I thought. But then there was insurance, filling up the tank(I think it was around $1.20 a gallon), and getting time off work and school, not to mention those ghastly oil changes. Who needs to change oil? Then, my next car, brand new, never driven by anyone but me and car lot dudes, a Mazda 323 Hatchb ack. I wanted a convertible Cabriolet, but was told teenagers don't belong behind a convertible by my parents. (Guess my parents changed their minds because they gave me a convertible MGB 2 years later as a wedding present, yeah, like they're going to live that down!). So, I went for very economical and sporty, no FUN anywhere in there. But it was new and smelled wonderful. I used to spray my seats with my Obsession perfume, yes, I was a perfume addict back then too. Vrrroooom vrooooooom! Well how fun! I'll be thta was a nice walk down memory lane! It was fun for me to learn what kind of vehicles you used to have!! I'm so glad things are looking up around there! I've been worried about you guys!